Mathieu van der Poel also wants to finish a full season as a cyclist in the coming years. Until the 2020 Olympics in Tokyo, he also focuses on mountain biking and cycling on the road. "After the Games, a discipline may fall away," Van der Poel told Sporza . 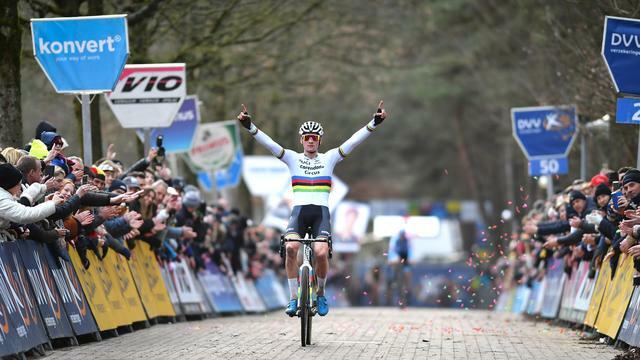 In the Belgian Hoogstraten he booked his thirtieth victory on Sunday in a very successful field season, in which he became world champion for the first time in four years. Earlier, Van der Poel said that in the future he would still drive at most ten field trips per season, but he will now return to those words. "I will definitely ride a full field driving program for several seasons." Coming Saturday, the eighth and last cross in the Superprestige will be held in Middelkerke. Van der Poel, after Sven Nys in 2007, can become the second cyclist to win all matches in the Superprestige in one year. "Normally I do not like the statistics and records, but now that I am so close, I want to realize that too." Van der Poel left for a short ski holiday to France on Sunday evening. Coming Sunday, he drives his last cyclo-cross in this winter. The Dutch champion on the field, on the road and on the mountain bike, then focuses his sights on the spring classics. On Thursday, February 21, Van der Poel will drive his first race on the road in the Tour of Antalya and on March 2 he will appear at the start at Omloop Het Nieuwsblad. Then in March and April he also drives Gent-Wevelgem, Crossing Flanders, the Tour of Flanders, the Scheldeprijs, the Brabant arrow and the Amstel Gold Race. In May Van der Poel shifts his focus on mountain biking, where he wants to qualify for the Olympic Games. The season starts in Albstadt, Switzerland, with the first World Cup match, after which 'VDP' wants to ride all other world cup events, the European Championships, the World Championships and a test event for Tokyo.